Stockbridge MA hosts this festival of the dramatic arts each summer. The Berkshire Theater Festival in Stockbridge MA, founded in 1928, has brought theater to the Berkshires for the better part of a century. It's organized by the Berkshire Theatre Group which stages performing arts events on five stages: three at the Festival's campus in Stockbridge, two in Pittsfield. Performances of theater classics, with big-name performers, are given in the Main Theater (once called the Berkshire Playhouse). Newer, more experimental works are set in the neighboring, smaller Unicorn Theater, and outdoor performances are at the Neil Ellenoff Stage. The Festival includes performances staged at two venues in Pittsfield: the historic Colonial Theater and adjoining Garage. From late June through August, plays are staged Monday through Saturday evenings, and on Thursday and Saturday afternoons. For details on performances and tickets, see the Berkshire Theater Festival website. Click here for information on all theater activities in the Berkshires. 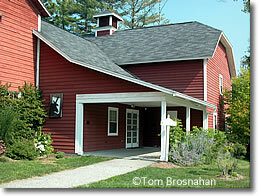 The Unicorn Theater at the Berkshire Theater Festival in Stockbridge MA.